2,184 refugees and migrants were interviewed by 4Mi in West Africa between 1 January and 31 July 2018, in Mali (Mopti, Gao and Timbuktu), Niger (Niamey and Agadez) and Burkina Faso (Dori and Bobo Dioulasso). This 4Mi trend report presents key data on the aspirations of the respondents, including preferred final destinations, factors driving the selection of destination countries and work related aspirations. It also presents data on intention to request asylum in the country of destination. 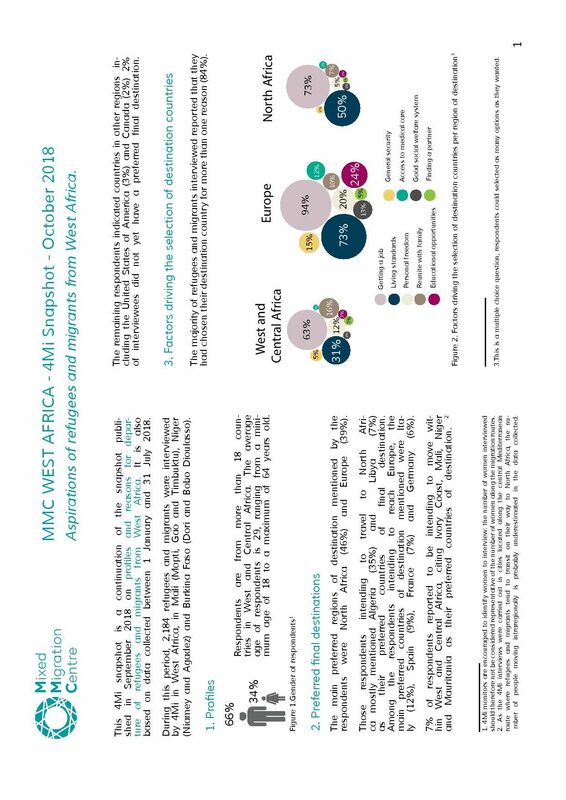 This 4Mi snapshot is a continuation of the snapshot published in September 2018 on profiles and reasons for departure of refugees and migrants from West Africa.